The year was 2003. A brave group of individuals with a shared interest in preserving local history and saving the story of the communities taken for the building of New York City’s reservoirs met in Grahamsville NY. That group spent many months learning what they had to do to begin a brand new museum. 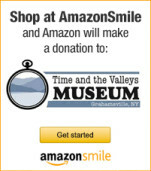 By 2004, they had received not-for-profit status from the IRS, and the Time and the Valleys Museum was born. A temporary museum charter soon followed from the State Education Department in Albany. Located in the Town of Neversink Town Hall, and partially supported by the Town of Neversink, subsequent years were filled with fund raising events, educational programs, establishing a local history resource center, the collection of artifacts and photographs, and much more. Hiring a part time director in 2009 helped the energetic museum board prepare to move the museum into a much larger building, an annex of the brand new Daniel Pierce Library. The museum moved into the three floor facility in June, 2011. Since that time, the Museum has created two permanent exhibits: “Water and the Valleys” and “Tunnels Toil and Trouble”, a museum shop with trained, dedicated volunteer staff, a Local History Research Center, and several temporary exhibits. In 2018, the 1930’s Lost Catskill Farm opened with a house, barn, woodworking shop, blacksmith shop and other farm outbuildings. Created to illustrate life on a family farm before being removed to build NYC’s reservoirs, it is interpreted using the most advanced technology, including tours for mobile devices. The museum’s long range plan is to create a “Museum Without Walls”, to be both indoor, outdoor and virtual, enthusiastically bringing history and the environment to others, wherever they may be.